COMMENT | I only ask because Khairy Jamaluddin is the minister for youth and sports and M Saravanan, the alleged agent provocateur behind the attack on Tamil Malar employees, is his deputy. Why is a deputy youth and sports minister confronting journalists at their places of work and “attempting to stop violence” carried out, in his own words, by “MIC Youth boys”? If the allegations are true - that this is not the first time he has confronted members of the press at their work premises - what does this say about the Youth and Sports Ministry? Personally, I have always held the view, and hold it still, that any organisation - especially that of the state and political parties - which has a “youth” bureau, has a strong whiff of fascism. This is especially so in Malaysia where racial and religious divisions are not only politicised but are codified in our legal system. So, what is the official position of the Youth and Sports Ministry when one of their leaders is part of an investigation of possible “rioting”? On that subject, I have a question for the newly-minted inspector-general of police (IGP). What kind of outfit are you running here? When Dang Wangi police chief Mohd Sukri Kaman claims that the incident where journalists are assaulted in their premises is investigated as “a riot between two groups, and it involved many people”, it is a shameful excuse of public service. If you want to know why people have so little faith in our police and justice system, all you have to do is look at this latest incident and the way the police are categorising this case and carrying out their investigations. IGP Mohamad Fuzi Harun claims to be aware of the demands of his new job and the expectations of the average citizen. Then his first priority in this case is to ensure that investigations that involve a ranking member of the ruling coalition is investigated in a transparent manner and this horse manure of blaming both sides - which is what this section is - should be abandoned. Puchong MP Gobind Singh Deo is absolutely correct when he asks, “If a group of persons comes to confront you at your premises, and you respond reasonably, can that be said as rioting?” Indeed, what can the average citizen take away from this? When you defend your home against robbery or trespassing, you could be charged with rioting? When you defend your business against the intrusion of thugs or criminals, you could be charged with rioting? Or is there a more insidious reason why this media organisation is implicated in the violence? Could it be that the state wants to impute there is legitimacy in the conduct of one of its actors – a deputy youth and sports minister – and that the provocation for such an act was because the news organisation was carrying out its duties of reporting the news? Is this a warning to all news agencies in Malaysia? If Tamil Malar was indeed engaging in “fake news” as Saravanan claims, then why does he not sue the daily? Such a legal remedy does not embarrass the Youth and Sports Ministry and is within his rights as a citizen of this country. Why is it that these MIC Youth boys act as his emissaries and that he needs to go Tamil Malar to “stop” a violent incident from occurring? Is this the function of the Youth and Sports Ministry or does Khairy, as the head of this organisation, have no issue with his deputy engaging in such behaviour? We always hear of how the ministry wants to engage with young people but how does the behaviour of the deputy minister affect this process? Is this really the kind of behaviour that the Youth and Sports Ministry endorses? In a functional democracy, this deputy minister would have been suspended from his duties – whatever they are – until investigations were completed and the heads of his ministry would have weighed in condemning the violence that occurred. I guess Khairy is too busy doing whatever it is he does to be bothered by how a deputy in the ministry he leads is allegedly waging war on the free press and allegedly engaging in violence against citizens of this country. All this, of course, has nothing to do with the ministry which supposedly is an avenue for young people to express their hopes and desires for this country. On the other hand, does Khairy think that this is an issue that only affects the Indian community and this has nothing to do with the ministry he leads? This is a fair enough proposition, I suppose. 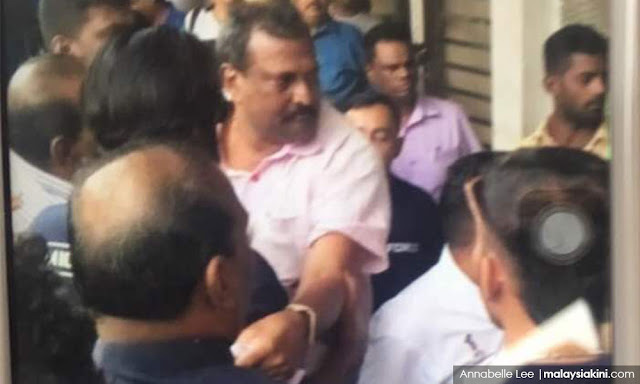 If Indian representation in the Umno regime is mere tokenism, then why should the behaviour of a deputy minister – any non-Malay deputy minister – be of concern to the ruling Malay elite. After all, the allegations of gangsterism within the Indian community is an established narrative that serves the purposes of the ruling elite in this country well. This merely means that people would go, “well there is that MIC gangster culture, what do you expect” narrative and the Malay ruling elite would just think it is the price of making a display of Indian representation in the ruling coalition. I am down with that too, but it just goes to show how full of horse manure the Ministry of Youth and Sports really is. I always get calls from people claiming to be connected to the MIC whenever I write articles critical of the political party. The calls always follow the same pattern. The MIC is attempting to rehabilitate its image in the Indian community. The MIC is attempting to go to the grassroots and solve the problems faced by the disenfranchised of the Indian community. Well, this incident proves that the reason why the Indian community is abandoning the MIC is because the community, unlike the Youth and Sports Ministry, has had enough of the thug culture that is all pervasive in the MIC. Do not blame journalists for merely reporting the writing on the wall.